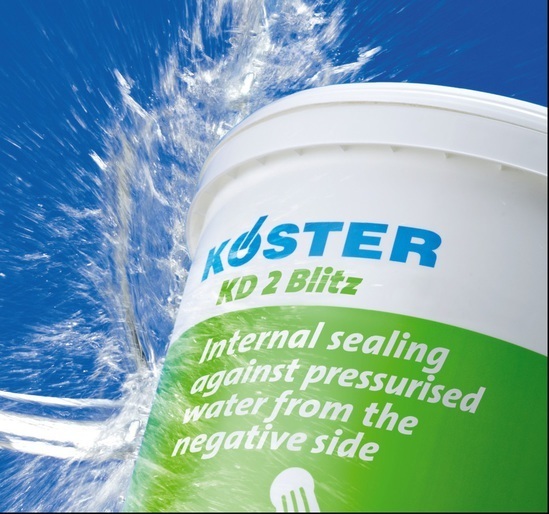 The KÖSTER KD System stops active water ingress and safely seals off pressurised water from the negative side. It is resistant to salts which are harmful to the building structure, and to aggressive substances which are present in the ground. 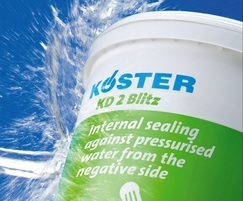 Salts will not detach the fully cured KÖSTER KD System coating from the substrate. Fast curing mineral sealing slurry with excellent resistance to aggressive ground water and high water pressure. Highly reactive powder with extremely short setting time. 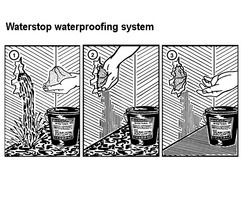 With application of the dry powder, active water leakages are sealed within seconds. Extremely low viscosity silicifying liquid. The active ingredients penetrate deeply into the substrate and react to form an insoluble compound. The pores are plugged and permanently sealed through the mineralisation process.